Okay, so normally how this post-series works is I tell you all about a fanfiction story I'm recommending this week. That's how this post-series normally works? Right? Welp, that's not how this particular post is going to go. Long story short, I've had a generally busy week, and I had to unexpectedly pick up one of a family member's days for looking after my grandparents. Yes, my grandparents have professional carers going back and fore to the house, but they don't have live-in carers. They have carers for my grandmother's medication, washing, dressing, etc., but that still leaves them with gaps - cooking, cleaning, etc. - that we as a family fill in. So I haven't had time to actually find a fic that I think is good enough to recommend to you. I'm not leaving you entirely without your weekly fanfiction fix! Check out this awesome-sauce open love letter to fanfiction by Eileen Gonzalez @ Book Riot for all the fandom love. And as an extra-treat, I'm going to direct you to the lovely Caro @ Cat on the Bookshelf. Caro runs the Fanfiction Reading Challenge 2018, and is an avid fanfic reader - especially of Harry Potter fanfiction. 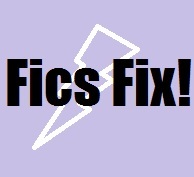 Her latest is this post on fics where Harry Potter has new or different powers to in the books. You can also check out her previous posts on fanfiction here. I hope that'll keep you little fanfiction-seeking nerdlets happy until I (hopefully!) return to business as usual next week. Friday Fics Fix - Whose Shield Are You? Things have been a bit roller-coaster-ish the last few days - my grandmother is back in hospital atm, hopefully not for long.